Designed to create safe working environment in buildings where forklift traffic and pedestrian traffic intersect, Collision SentryÂ®Â uses passive infrared motion detectors to see around corners, providing LED warning lights that alert forklift drivers and pedestrians to approaching traffic. Self-powered unitÂ operates onÂ D-cell alkaline batteries, eliminating need for wiring to electrical system. Installed without tools, system includes magnet mounts for snapping onto pallet racking systems. Collision Sentry®, designed to create a safer working environment in industrial buildings where forklift traffic and pedestrian traffic intersect, is the newest product offering from Sentry Protection Products. Like a traffic light, Collision Sentry provides a visual warning to drivers and pedestrians that traffic is around the corner. Collision Sentry is easy to install, self-powered, compact, highly visible and reliable. Lakewood, OH, -- In industrial settings where forklift traffic and pedestrians intersect, Collision Sentry® can help reduce or eliminate "blind corner" collisions by providing a visual warning that alerts forklift drivers and pedestrians to approaching traffic. Collision Sentry uses infrared motion detectors to "see" around corners. When motion is detected on both sides of the corner — meaning a collision is possible — LED warning lights signal in both directions that there is traffic around the corner. Every day in thousands of industrial environments, pedestrians and forklifts maneuver through buildings covering the same territory and often navigating the same path. When those paths cross, the result can be damaging - not only to the equipment and facility - but more importantly - to people. • Self-powered using standard D - cell alkaline batteries, eliminating the need for wiring to an electrical system. Batteries are designed to operate for one to two years depending on usage. A low-battery indicator warns well in advance of batteries needing replacement. • Passive Infrared Motion Sensors detect motion on both sides of the corner, sending ample warning to the forklift driver and the pedestrian to correct their movements. PIR sensors are a proven technology used in security lighting and alarm systems. They are rugged, feature a wide lens range and don't wear out. The PIR sensors are pre-set and ready to use. No adjustment is necessary. • Highly visible LED lights flash when motion is detected from both directions. Collision Sentry's warning lights flash only when someone is really there, creating less false reads and sending a powerful visual warning. • Collision Sentry is portable, compact, lightweight and can be deployed immediately following installation. Installs easily and virtually anywhere. No tools required. With the included magnet mounts, units can be easily snapped onto pallet racking systems. A tether is included with each unit for added fastening security. 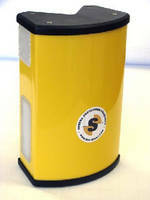 Sentry Protection Products is a leading provider of innovative, impact resistant products for industrial applications. Manufactured in the United States and Europe and sold worldwide, the award winning, patented product line includes Column Sentry®, Rack Sentry®, Concrete Wrap™, Park Sentry®, Corner Sentry™ and Collision Sentry®. Sentry is headquartered in Lakewood, OH. For additional information call 1.888.265.8660, email info@sentrypro.com, visit www.sentrypro.com or follow Sentry's Twitter feed @SentryProtect.